Is everything in a state of chaos? The answer is yes it is. But it’s not what you think. Chaos is a nonlinear ordering that explains many phenomena. 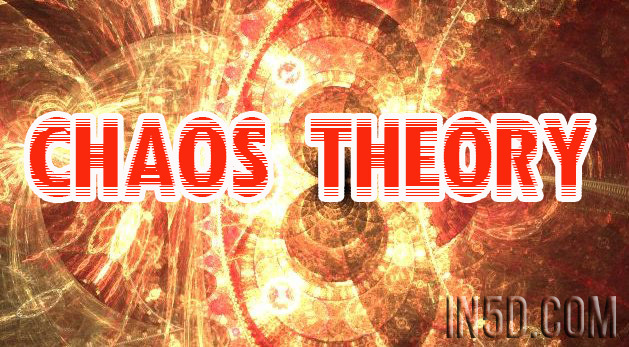 Chaos theory is the study of chaos. The theory explains such things as why leaves have repeatable patterns and why antennas need to have curtain shapes to receive all types of radio waves. So what is nonlinear? Well linear means in a straight line and, in analysis, a straight line explains many trends (as in linear regression). Nonlinear means not straight; in other words, everything else. The planets follow a non-linear elliptical path around the sun. The pattern of branches on trees follow a non-linear algorithm of reproduction. The pattern of trees populating the forest floor follow a non-linear pattern of spacing. Blood vessels and tree roots follow a non-linear pattern of distribution. The inclination is to think that chaos has no order but that is a mistake. Chaos is random and has built in order. The confusion arises when random is conflated to mean without order when they are two different aspects of a phenomenon. Without going into details, randomness means without pattern; however, randomness has boundaries; i.e. can be bounded by probability and possibility. Order in this context is a set of built in rules and processes that define what will happen next and next and next. The snowflake has randomness bounded by temperature moisture and wind to mention a few determinants. However, the flake formation has an intrinsic order that prescribes the number of tines, size, and pattern the flake will become. Together, randomness and order shape each snowflake as a completely unique entity. A note about the quantum underpinning. The Higgs Boson is primarily responsible for randomness and order by providing the quanta of energy needed at every point in the universe. The butterfly effect is a metaphor for the relationship of a system to its initial conditions. It was postulated in the 1970’s by Ed Lorentz to account for weather predictions. It turns out that systems that are sensitive to initial conditions, such as weather, diverge greatly with the slightest difference in initial values. In this example, a butterfly flapping its wings accounts for a large divergence in weather patterns after just a few hours using the same model without the butterfly effect. This is the reason predictions for these kinds of models are inaccurate after a prescribed time period, in the case of weather, it’s three days. What we learned in school was Euclidean geometry. Euclid defined a point (zero dimensions) then a line connecting two points (one dimension), then a plane composed of lines (two dimensions) and finally space composed of planes in three dimensions, presumed to be at right angles to each other. But this definition of geometry does not describe irregular shapes. Along came Benoit Mandelbrot who decided that dimensions had dimension. In other words dimensions can be fractionalized. He coined the phrase fractal, which is derived from a French word to mean fractional dimension. What Mandelbrot noticed was that as a person’s distance perspective changed, the object seemed to change dimensions; however, the degree of irregularity remained the same. This may seem too much to absorb so an example is in order. Measure the coastline of Italy. Easy enough, right? But as the measuring device gets smaller, the coastline gets larger. From 500 feet, it looks different than it does at 50 feet but the number of irregularities is the same. As the device (measurement standard) gets even smaller, the number of irregularities stays constant and the coastline gets longer. Indeed, the coastline becomes practically infinite if the measuring device is scaled to one centimeter. Every fractional dimension (fractal) actually multiplies the coastline length. Mandelbrot noticed that a set of repeatable rules could be applied to each successive fractal that demonstrated the regularity in the irregular shape. This became the new Geometry called Fractal Geometry. Fractal geometry is easily observed in clouds and mountains. Ask anyone how far away a cloud is and you will get several different answers because the fractals are identical from most distances and the scale is muted. Look at a mountain and hold a rock in your hand. They have the same irregularities. Hold them up to each other and they look the same. Now apply this same notion to blood vessels. The circulatory system has a large number of vessels in a small area and they take up a very small space themselves, about 5%; yet they effectively deliver blood to every cell. There are many examples of fractal geometry descriptions in biology: bronchial branching and heartbeat timing to mention two. These may seem complicated from a Euclidean perspective; however, from a fractal perspective, they are simple. They are simply coded instructions, a repeating process of bifurcation (order), contained within the organisms genes. This brings the discussion to full circle. Mathematics is different than all applied sciences in that it is never obsolete. It is based only on principles, called postulates that cannot be proven, and on theorems derived from them. Change a postulate and get a different form of the mathematics. In a sense, it is based on nothing and yet it explains the world we know and the one we don’t know. Chaos Theory is a branch of mathematics that uses repeating algorithms on computers to derive models and put forth conclusions. Through Chaos Theory many disparate disciplines have been shown to be similar; from the CGI of volcanoes spewing lava in a movie to the design of the smart phone antenna, they are all examples of nonlinear dynamics with rule based irregularities. In a sense, simple systems explain complex behavior. Chaos Theory gave a holistic solution to these problems. No longer did scientists have to reduce the problem domain. Another way of saying this is: no longer do we have to use linear solution sets that approximate small subsets of the problem then cobble them together to arrive at a solution. We can now use sets of nonlinear equations and program them into a computer then adjust them until we arrive at a model of what we perceive. This may sound difficult but because mathematics is so extensive, these equations are documented and catalogued. Chaos Theory is a way of thinking of problems/challenges no matter the discipline (organic or inorganic) completely as nonlinear multidimensional dynamic systems that are ordered, use simple nonlinear equation sets, and universal laws. Back to the snowflake; we see the universal law of pattern formation and growth coupled with the sensitive dependence on initial conditions of temperature, humidity, and the number of air particulates all used to determine the six branching tips’ formation and growth. The air turbulence determines the unique path, which determines the unique shape. Each snowflake is a history of the weather conditions along its unique path to the ground. All of these types of equations also apply to algae, cell walls, and dendrite growth. Chaos Theory changes many “known” system solutions that relied on linear methods from an approximation at best to a working model of that system complete with what-if analysis. Before it, linear bias was the norm. Now there is a full on nonlinear upheaval. The way of thinking in terms of Euclid are relegated to man made objects: buildings, vehicles, tools, etc. For this reason, Chaos Theory applied to photos can accomplish remarkable results. Using Chaos analysis, all man made objects are easily identified regardless of the attempts to camouflage them. This is because there are no irregularities in man made objects (think Euclid). Additionally photos converted to fractals can be magnified indefinitely (as in Mandelbrot space) compared to the pixel (man made) method, which can be magnified down to the pixel size (e.g. 1080p). Platonic solids are associated with atomic level entities. They are the building blocks for what we see in our fractal world. They are below our fractal range of sight; however, they are accounted for in Chaos Theory. Particle physics is also accounted for in Chaos theory. Since we are discussing the level above atoms (ie fractals we can see), we won’t bring them or particle physics into this discussion. If nature is defined through a Chaos Theory Geometry whether animate or inanimate and man made devices are defined through a form of Euclidean Geometry what does it mean? Nature not only conserves energy within each system, she also reduces entropy. Man made Euclidean objects on the other hand do not conserve energy and create a great deal of entropy. (Entropy, in this context, is a measure of the disorder of a system). This may seem counterintuitive until we examine the process of creating Euclidean objects. The most studied example is the steam engine. It may appear orderly but it is only about 90% efficient and requires maintenance to keep it whole. This along with other factors create a good amount of entropy. And while energy is conserved, it is not within the engine system. From the moment a man made object is created, it begins to deteriorate (entropy in action). The next phase of our existence will be determined by whether we choose a Fractal Geometry path or a Euclidean Geometry path. Nature has already made her choice. We must become one with nature to choose the Fractal path. It is a different way of “thinking” and being. Chaos Theory is just the mathematical method of describing it.